There’s nothing flash or trendy about this place… in fact the décor is old fashioned and a little bit daggy – but maybe that adds to the whole La Tombola charm. 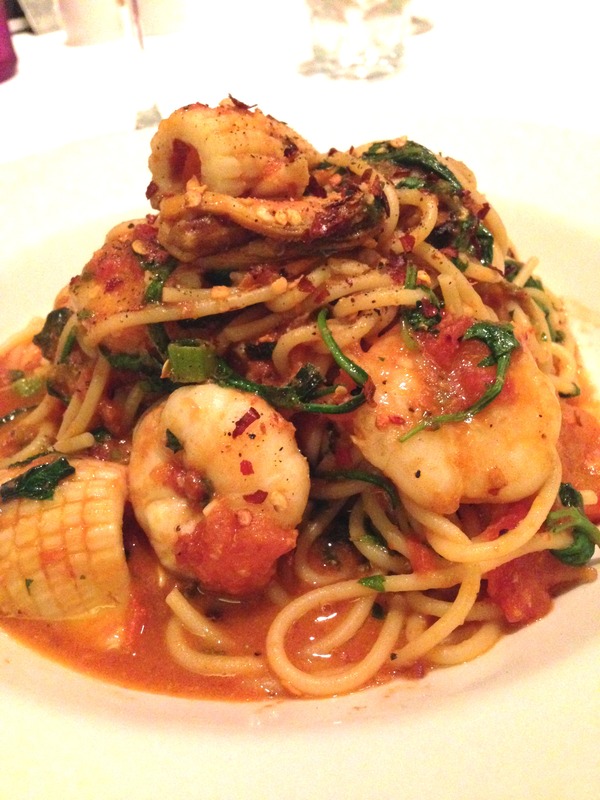 La Tombola Italian Restaurant in Parkside has been around for over ten years and touts modern Italian food. You’ll be heartily greeted by owner and host Tony De Leso – he and his friendly staff make for a welcoming and warm atmosphere – the sort of place you just want to settle into. It’s relaxed, clean and the chairs are comfy. I was surprised it was quite busy for a Monday night and it was a mixed crowd. We started with the Bruschetta Al Pomodoro e Basilico – toasted ciabatta with fresh tomatoes, basil, garlic and extra virgin olive oil. A lovely start – fresh, bright red Roma tomatoes atop nicely toasted golden bread. I enjoyed the Insalata Calda Di Calamari – fresh calamari tossed in lemon pepper and rice flour, deep fried and served with kalamata olives, lettuce, sun-dried tomatoes, roasted capsicum and Spanish onion dressing. The squid was cooked beautifully and the salad dressing of balsamic and olive oil was nicely subtle. A really good, simple dish – I couldn’t fault it. Onto mains. For me, it had to be the Spaghetti Marinara. I’d recently had a good Marinara at European Café and I was keen to see how La Tombala’s compared. In short, it was excellent. It was a decent size with lots of prawns, squid and mussel meat and the tomato sauce was tasty – and I like that they bring out a bowl of optional chilli flakes along with the offer of pepper and parmesan. Lots of chilli flakes for me please. My dining partner had the Ravioli Ortolani Rosati – fresh ricotta and spinach ravioli tossed with roasted eggplant, zucchini, onion and sun-dried tomato in a rosé sauce. She loved it, describing it as full of flavour with a nice creaminess, and nothing overpowering about it. I had a taste. I concur. To finish, it was the Duo Di Nocciole & Cioccolata – home baked hazelnut cheesecake served with a rich dark chocolate ganache – nice and light and great texturally. It was a really enjoyable meal. We never felt rushed – even when we were the last ones in the restaurant. And, a couple of more reasons to go – there’s convenient parking out the back, and it’s on the Entertainment Card. Definitely worth a visit.